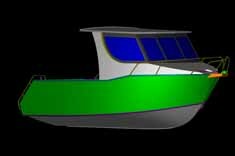 This is a serious boat at 7.6 metres long and 2.34 metres wide, a sea boat designed for the toughest conditions. 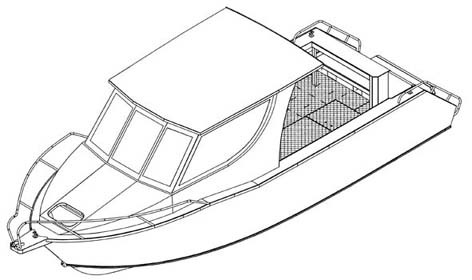 This boat has been designed to take you a long way and you can even set it up to stay on it. This is a reverse chine design, while still using the DBA chine section to make the chine smoother and help curl the water back down. 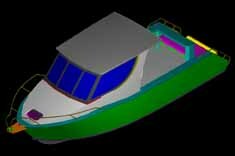 This boat has an extra additional stringer on the inner chine to hull connection, so that you are not relying on weld strength for the seem, both panels are pushing against a stringer. 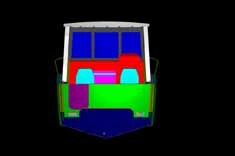 The Mahi Mahi (T1)with twin 130hp motors and 300 litres of fuel will take you where you want to go quickly and safely. The 7.6m Mahi Mahi includes a large kill tank that drains directly out through the pod and a sealed self draining deck. 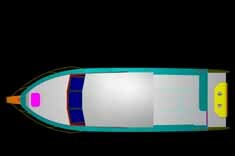 For the swimmer or diver, the Mahi Mahi comes with a transom door and a nice flat area across the whole back of the pod. 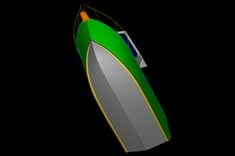 This boat has been designed with a twin engine pod and 300 litres of fuel. If you are interested in this boat, but would like only a single engine set up and 200 litres of fuel, check out the 7.6m Mahi Mahi T2. 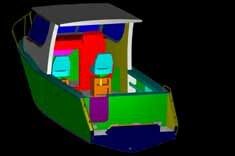 If you would like a 7.6m Mahi Mahi and don’t feel confident of building it, one of our licensed agents will manufacture this boat for you. For more information or a list of materials in the flat pack, Feel free to contact us.